We are super thrilled to be part of Food Hacks Berlin, organized by HackerStolz. The idea of the hackathon is to find digital ideas that can revolutionize the food industry. Food delivery process has seen lots of innovation in recent years, but it’s obvious there’s so much that can be done: better services related to what we consume daily, smart apps that automate the burden of manual calories intake and many more. Over 100 participants from 20 countries hacked in Rainmaking Loft, one of the well known startup destinations in Berlin. It’s inspiring to see so many motivated hackers with various experience in so many industries. One of the reasons we love hacker events in Berlin is the amazing mix of talent and the diversity of the participants. There was a group of bright Ukrainians that travel by bus over 12 hours, people from Poland, Holland, UK, Switzerland to name a few. Imagga was an API partner at the event. We’ve trained two special categorizers to help developers get the best out of our image recognition technology and to make sure they build amazing apps – meal classifier that can recognize over 300 cooked meals and food & veggies classifier. Chris presented Imagga API at a dedicated workshop, talking about how you can use Imagga API to recgnize pictures of meals, fruites and veggies. Neighborhood Cuisine – A mobile app that lets you get together with your neighbors to cook tasty recipes from your leftovers. HelloFridge – the easiest way to save your ingredients from going bad by combining them to fit delicious recipes. Surprise Meal – Provides surprise ideas for recipes. Mint – A unique way to discover a new culture through music, art and food. lekkerlekker – Your one stop shop for finding the best recipes and directly buy alls groceries you need. TraceYourFood – See the journey of the food you consume! KeineWaste – KeineWaste connects food businesses and volunteers in real-time, converting food waste into food donations. WTF: What the FOOD – So you’ll never run out of müsli again. 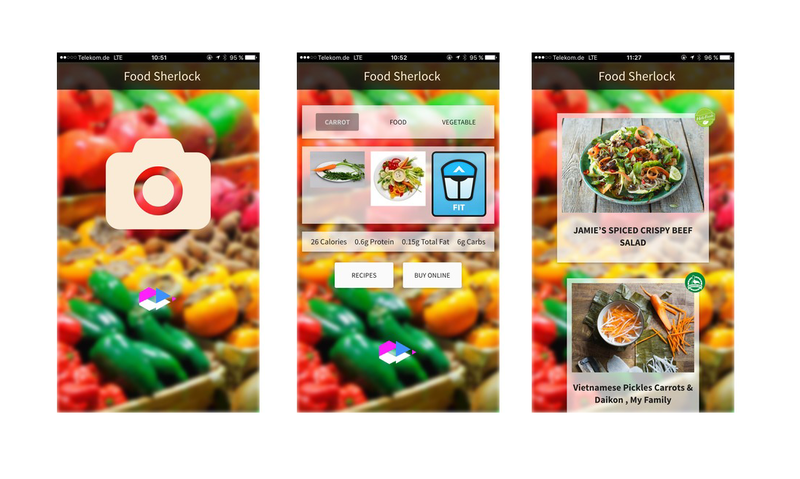 Our favorite hack is Food Sherlok, developed by Team Baker Street 😉 Food Sherlok lets you take a photo of any ingredient and gives your nutrition details, recipe suggestions and the possibility to buy it online. The mobile app utilizes Imagga API for the image recognition part, Spoonacular API for the nutrition details and HellowFresh API for the recipe suggestions and possible food delivery. Here you can find the code of the hack. 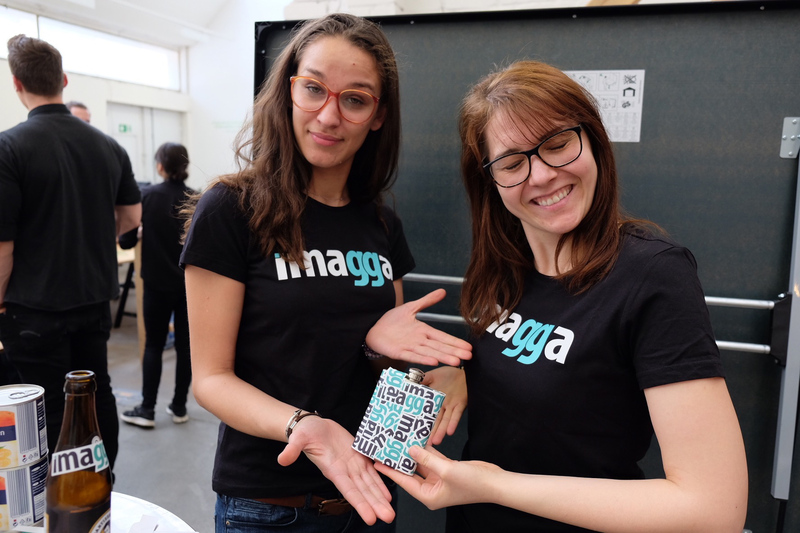 Imagga prize – GoPro camera, t-shirts and free API access went to Team Baker Street for their incredible work and valuable feedback. You can’t do much for the limited time of the hackathon, but the team is already making some bold plans for Food Sherlock. They think it will be quite useful if they can generate location based sate for retailers, work on improving the image recognition service with data specific for different geographic locations, experiment with new ways to visualize the results (may be adding something like search heat map overlay) and offer text to speech recognition to make sure refugees can also use the app.